François-Xavier Rocheleau was a prominent member of the francophone community in Kingston at the turn of the 19th century. He arrived from Trois-Rivières, Quebec, in the mid-to-late 1790s with his wife Marie-Louise (also known as Lisette) and at least one daughter, Elizabeth, who was born in 1794 in Montreal. He was a master mason who specialized in building churches and cathedrals. In 1796, Rocheleau and his wife welcomed a baby girl, Charlotte, and the next year bought a lot of land along Princess Street. 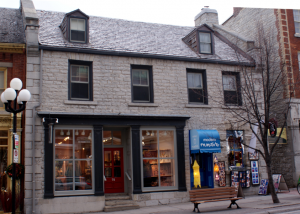 There, Rocheleau built a large, 2-story house for himself and his family, which was completed in 1808 and still stands today at 68-70-72 Princess Street (as evidenced by his initials that can be found on the top right corner of the building’s façade). The house was later used as an office for John A. MacDonald and Alexander Campbell in the 1840s. In 1802, Rocheleau became a constable for the peace in the town. He also contributed to many projects around town: he was asked in the early 1800s to build a wall of stone around St. George’s Church and another one around the Court House. 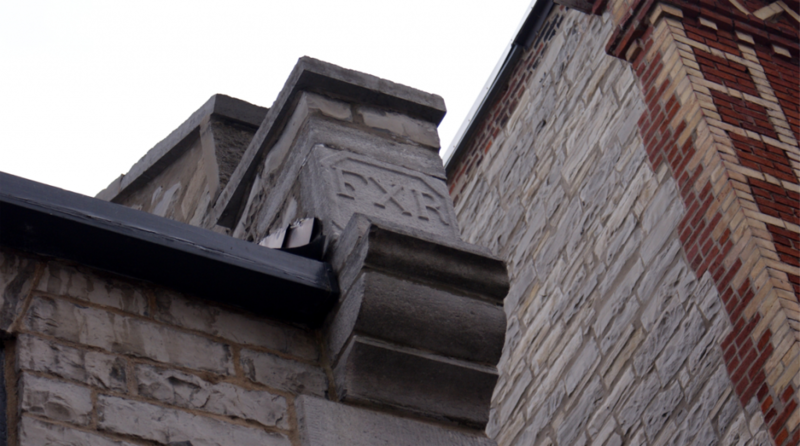 His biggest project in Kingston by far, however, began when Reverend Alexander Macdonell, the first Catholic bishop of Kingston, commissioned him to build a church in the town for the growing Catholic population in 1808. This church, St. Joseph, served the Catholic people of Kingston for 40 years, until 1848, when St. Mary’s Cathedral opened its doors. The entire Rocheleau family firmly established itself in the Kingston community: Marie-Louise became the godmother of at least three children born between the years 1797 and 1808, and the Rocheleau children married members of prominent Anglophone families in Kingston (Elizabeth married a certain James Kipp, son of Samuel and Mary Kipp, in 1813, who had made a name for himself in the fur trade business).